On this map, I've tried to sketch where the old flight line was (red), the line we tried on Sunday (yellow), and what I think Erol is proposing (green). I've put both an unmarked and a marked copy of the sketch above in the photo section of our Yahoo group. 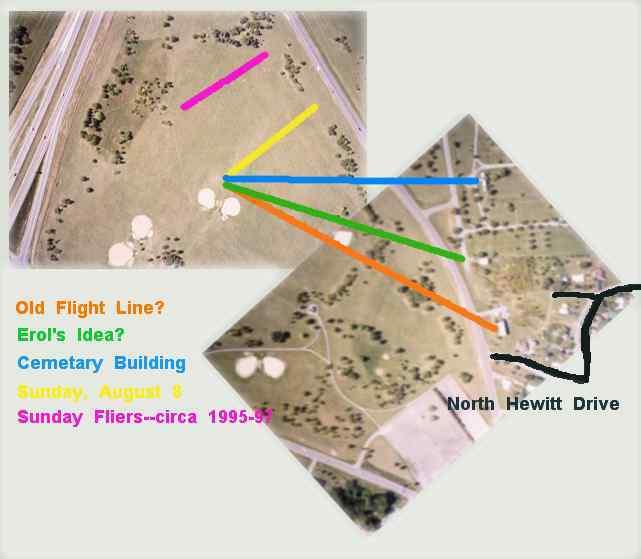 This Google composite map shows the relationship between our flight line and North Hewitt Drive. I doubt very much that anyone routinely flies that far out of the park. In looking at your maps and satellite photo, I can tell you with near certainty that it's non-clubbers flying over Hewitt. When fishing in the reservoir I've seen them flying from the OTHER SIDE of military road (yeah I know... tiny) from the area where you have the words "Military Road" on the satellite map to well east of the parking lot over there. If you walk from that parking lot over by the reservoir, up the path to the top of the embankment, through the opening in the fence. Now walk east on top of that embankment about 25 to 50 yards (this is where I was fishing), I had planes flying right behind me as I was fishing. I believe that puts them in that area where you have the words "N. Hewitt Drive" on your satellite map. Now because they were STAYING there in that area (not like flying through it making a turn headed back to where the club flies) THAT's what caught my attention because I thought to myself, "Why would anyone fly HERE when there's so much more room over THERE?" Again... this wasn't a fly-by. These were planes staying in that area. One was a red biplane and the other was (I'm pretty sure) a Christian Eagle in White with the multicolor "NBC Peacock" pattern on top wing. Yeah they were that close to the reservoir itself. These weren't 40-sized planes. I would guess they were 60-sized at least but certainly not anthing as big as Erol's or big plane. They appeared to be having fun dog fighting each other and a couple times actully were over the water (pretty high up). I've seen this activity more than once. day and time... sheesh... you guys are harsh. At least one time would have been on a saturday morning early... early early... like before 8am maybe or right around 8am. I don't know exact dates, guys cause I don't mark my fishing times on the calendar, you know? Another would have been in the evening. I remember the ball diamonds were in use. (hence the fishing rather than flying). And it wasn't just this year even. I've seen these 2 planes up in that area as far back as last year maybe the year before. Before I joined the club even while fishing with my brother-in-law. Sorry I'm not more help on this. I've been reading the conversation here and it never DAWNED on me because I didn't know where North Hewitt was and when I saw Marty's photos I went...."HEY!". 3. The noises described are those from lawn mowers, power tools (chain saws), tractors, etc. Inquiry at the Town of Niagara shows that the town does not have any noise ordinance and they have had no complaints related to noise at Reservoir State Park. 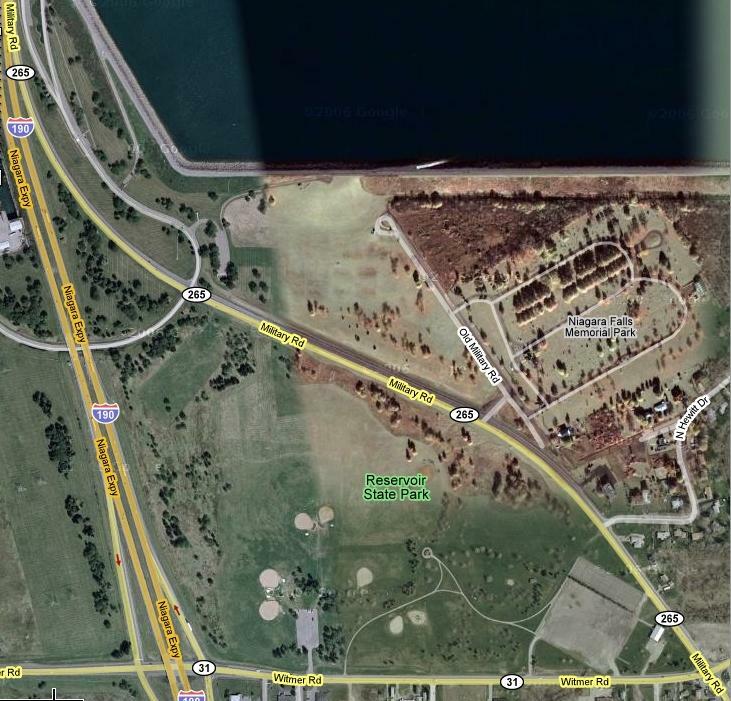 They pointed out what we already were aware of, that the park is almost entirely in the Town of Lewiston. The parking area and the park including the first two softball diamonds and the immediate area around them is in the Town of Niagara. 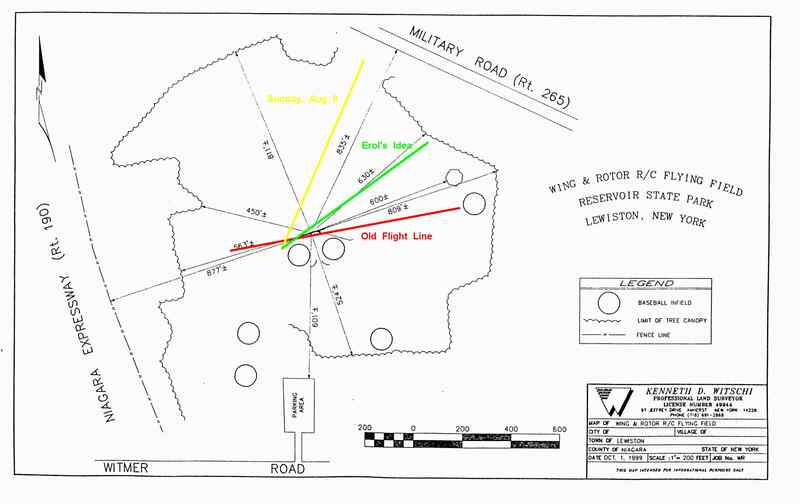 Our flight line and flying area is almnost entirely in the Town of Lewiston.